2018 - Join the Fun! 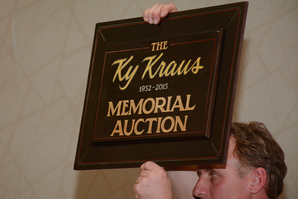 ​Ky Kraus Memorial Auction - Sat. 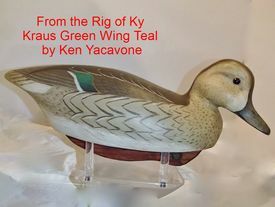 6 p.m.
2017 Saturday Auction, from rig of Ky Kraus, Green-winged Teal, by Ken Yacavone. 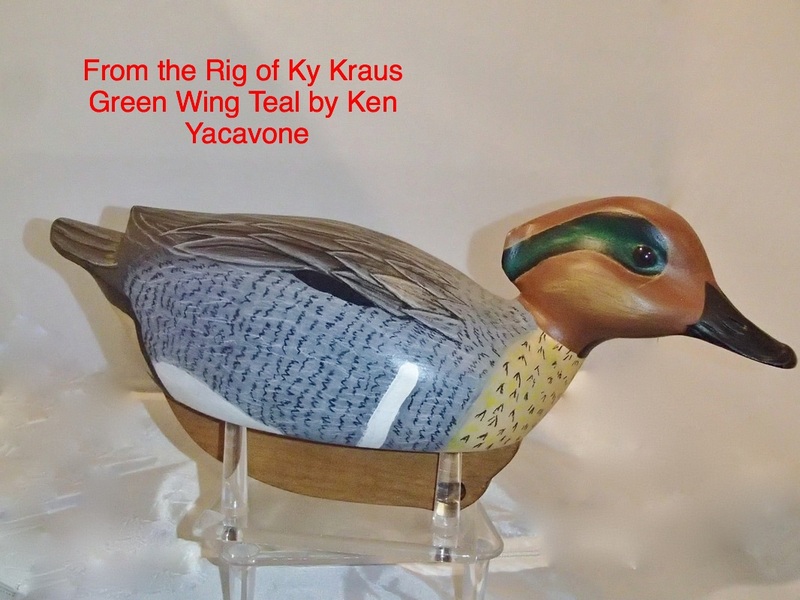 2017 Saturday Auction, from the rig of Ky Kraus, Blue-winged Teal by Ken Yacavone. 2017 Ky Kraus Memorial Auction, Sat. March 11, 6 p.m., Ballroom. 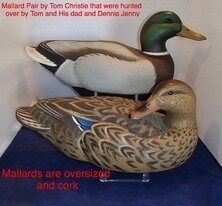 2017 Saturday Auction, Mallard pair by Tom Christie that was hunted over by Tom and his Dad and Dennis Jenny. 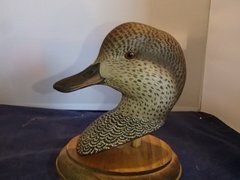 Mallards are oversized and cork. 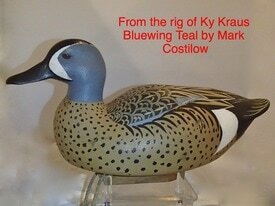 2017 Saturday Auction, from the rig of Ky Kraus, Blue-winged Teal by Mark Costilow. 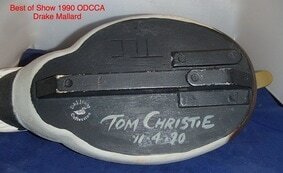 2017 Saturday Auction Decoy, signed by Tom Christie. 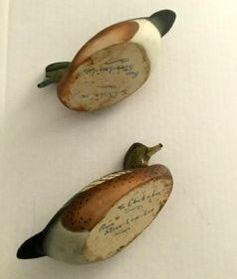 Signatures of Ward Brothers Decoys. 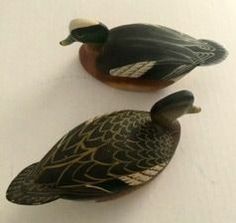 Outstanding Ward Brothers Wigeon pair seven inches long. From the Ky Kraus collection, Gadwall head by Mark Costilow signed 1999 ODCCA Steak Fry, by Dennis Jenny. Front view of Gadwall by Mark Costilow, by Dennis Jenny. Check in Friday 7 p.m. - Auction starts at 7:30 p.m. 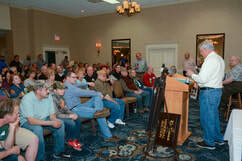 The intent of this event is to introduce decoy collectors to decoy carvers. This is a great opportunity to make new connections at the show and show off your Decoys. This event will be limited to 50 entries, first come, first entered. Limited to 2 entries per person. Pairs equal one entry. Entrants will be responsible for pricing the decoy and coordinating the final payment arrangements with Buyer. The ODCCA Board reserves the right to make first selection from the entries for the price of $200. This selection will be used for fund raising event at the discretion of the ODCCA board. Any decoys not purchased will be returned to the entrant, no fees associated. and carvers, promoting the camaraderie for a common interest, The Decoy! 1. Only waterfowl related items will be accepted for the auction. No Firearms are permitted at the auction. Donations to the auction are always greatly appreciated. 2. Registration of the auction items will be from 2 p.m. to 5 p.m. on Saturday. Viewing of Auction items will take place at 5 p.m. in the Boardroom. 3. All bidders must use a number in order to participate. Bidders must register at the table in the Ballroom beginning at 5:30 p.m. on Saturday, March 10, 2018. Appropriate identification will be requested. 4. The ODCCA reserves the right to withdraw any item before the sale and shall have no liability whatsoever for such withdrawal. 5. A reserve may be declared at the time of registration. The presence of a minimum bid will be made known at the time the item is auctioned. If the minimum bid is not reached, the item will not be sold, but a fee of $10 or 15% of the highest bid must be paid to the ODCCA. 6. The ODCCA does not certify nor guarantee the accuracy of the descriptions provided by the seller nor the authenticity of the items submitted for auction. 7. The highest bidder acknowledged by the auctioneer shall be purchaser. In the event of a dispute between bidders, the auctioneer shall have absolute discretion as to who was the successful bidder or he may re-offer the disputed item for sale if he so wishes. 8. A 15% buyer’s premium will be added to all items sold except for Cocktail Birds to be paid by the buyer as part of the purchase price. A 15% seller’s premium or $15, whichever is greater, will be charged to the seller and will be deducted from the proceeds prior to disbursement of funds. ODCCA Members will be charged a reduced cost of 10% seller's premium or $10 which ever is greater. The premium goes to benefit the ODCCA. 9. No items will be released until paid for. Cash, Checks, Visa and Master Card only will be accepted with proper identification. All purchases must be claimed by the end of the auction. 10. Although care will be taken to safeguard and protect items submitted for auction, owners release the ODCCA, its representatives and the auctioneer from any losses due to theft, damage or other causes. 11. Payment to the seller of successfully auctioned items will be made by check within 10 working days of the auction. This event has been relocated to the Ballroom so everyone can participate and enjoy the "refreshments". This is a great opportunity to make new connections and show off your decoys. 7 p.m. Check-in in the ballroom. 8 p.m. Premier of the documentary "Million Dollar Duck" featuring wildlife artist Adam Grimm. The intent of this event is to introduce decoy collectors to decoy carvers. This is a great opportunity to make a new connection at the show and show off your decoys. 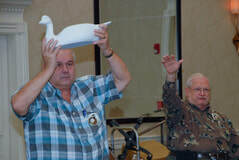 Any and all styles of decoys accepted, they may be floated in the pool to demonstrate the decoys finer attributes. The ODCCA Board reserves the right to make first selection from the entries for the price of $200.00. This selection will be used for a fund raising event at the discretion of the ODCCA board. Any decoys not purchased will be returned to the entrant, no fees associated. Again this year, entry fees and attendance fees will be waived as the ODCCA demonstrates their appreciation to both collectors and carvers, promoting their camaraderie for a common interest, The Decoy! Snacks and Keg beer will be provided by ODCCA in the ballroom, 7:30 p.m.
New at the Saturday Night Auction, ODCCA Members will be charged a reduced cost of 10% seller's premium or $10 whichever is greater. Also, we will feature your decoy on this website to further publicize your items. This is a great way to get a bigger bang for you decoy! 3. All bidders must use a number in order to participate. Bidders must register at the table in the Ballroom beginning at 5:30 p.m. on Saturday, March 12, 2016. Appropriate identification will be requested. 12. 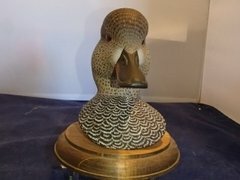 Anyone wishing to post there items below please email photo and information about the decoy to Bob Lund, woodcountydecoy@msn.com.